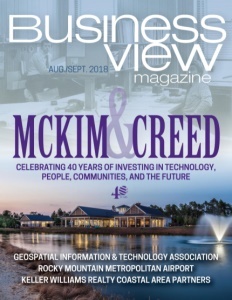 Business View Magazine interviews David Jones, Operating Principal of Keller Williams Southern Arizona, for our focus on leaders in the real estate industry. Formed in 2010 by Anthony Azar and David Jones, Keller Williams Southern Arizona started growing from the get-go and has never looked back. It started with 200 agents (70 percent came from Azar’s former Realty Execs franchise) and now has close to 450 working from two Market Centers, with three offices in Tucson, and one office in Sierra Vista. Joesler Village Market Center, in the north-central area of town, has an extended office in Oro Valley in northwest Tucson, and Kolb la Playa on the east side has a business center about an hour south of town in Sierra Vista. 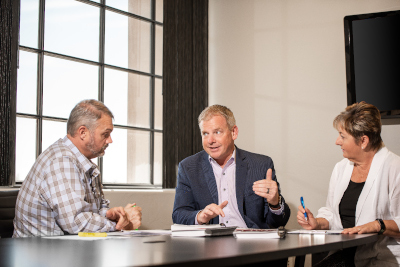 Operating Principal (OP) of Keller Williams Southern Arizona, David Jones, describes Keller Williams as a systems-based company, with its own proprietary models and technologies. “I tell people, if you buy a McDonald’s and run it like a Jack-in-the-Box, you’ll probably go out of business. If you buy a Keller Williams franchise, you run it like Keller Williams.” The philosophy on agents is that every agent is a business owner. All KW training and coaching is geared to help them build their business. It’s an interdependent model; agents are trained to be independent, given autonomy, an attitude toward business, extensive coaching, programs, and technology. 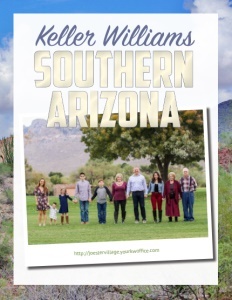 Keller Williams Southern Arizona has one ownership group that covers their entire territory – an ideal opportunity for synergy in a geographic area. Its agents cover every type of property sale: luxury; rural land; short sales; REO (real estate owned by a lender). The average selling price for a house is $200,000 to $250,000 – that price point in the Southern Arizona/Tucson area will sell quickly. It’s the sweet spot of the market; the center target. But there are also agents specializing in the south part of town that are still selling $130,000 houses. Jones says he loves having such a diversity of agents all playing under the same roof. Keller Williams believes in “for agents, designed by agents.” They call themselves a bottom-up company – training is done to teach people how to be the best business person they can be, not just how to be a better salesperson. The company is unique in that you could start as a new Keller Williams agent and, within three to five years, grow your business by learning how to read P & Ls, how to hire, to train, how to run your own team, if you choose. Or, you could take those same concepts, as a single agent, and learn how to get more done in less time. Speaking of technology, Keller Williams Southern Arizona stands firmly on middle ground in that arena. It doesn’t believe brick and mortar is going away, because human beings will always want personal interaction. On the other hand, an amazing amount of training videos, resources, and tools can be accessed and downloaded by agents online through KW Connect. A business tool called Career Growth Initiative (CGI) does lead generation, tracks numbers, creates reports, all on the KW Connect website. Keller Williams also has high-tech referral systems and a virtual assistant called ‘Kelle’ (an artificial intelligence app for mobile phone use). On a local level, KW Southern Arizona has great corporate tools to help people create their websites, learn to create mail and email campaigns, and control data management with the Edge database management system. The interesting thing about all Keller Williams technology is that any data loaded into the system belongs to the agent. If they decide to leave, they download that data and take it with them. Every real estate business relies on partners in related sectors for their success. Keller Williams Southern Arizona has a great partnership with Catalina Title, its preferred in-house title company. And it finds Movement Mortgage very enjoyable to work with because it has a culture very similar to KW, based on fun, productivity, and giving, with high integrity and high morals. It does quick closes and is involved with KW Southern Arizona, every day. Other valuable relationships include Old Republic Home Protection and 2-10 Home Buyers Warranty (KW Southern Arizona’s first partnership in 2010). Check out this handpicked feature on Dream Live Prosper Companies – Fixing real estate.